One of the biggest challenges facing the implementation of the new EU economic governance in Bulgaria is to hold more regular, more informed and more in-depth public discussions on the topic. 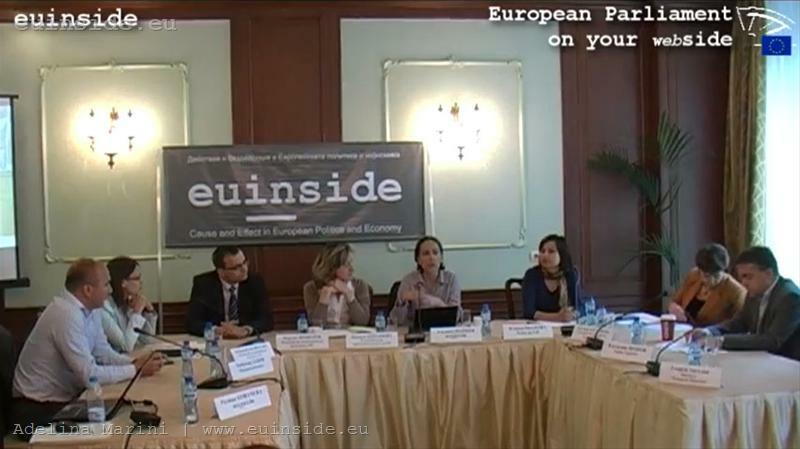 This conclusion was outlined during the discussion organised by euinside in Sofia in July with the participation of representatives of the European and national parliaments, the European Commission, prominent economists, political scientists, media and citizens. The conversation was a natural continuation of the discussion we held in Brussels with members of the largest political groups in the European Parliament. Why the EU economic governance? The package of six legislative proposals aimed at improving EU's economic governance is a key tool for overcoming the mistakes of the past 10 years, which became painfully obvious during the crisis. The “one-legged” Economic and Monetary Union – the monetary foot is there, but the economic foot is missing – has been heavily swayed by the debt crisis. This exposed the need of urgently finding ways for better coordination of member states' economic policies on the one hand, and more effective sanctioning mechanisms, on the other. Therefore we have chosen to highlight this particular topic, moreover given the envisaged serious changes, which are totally unfamiliar to the Bulgarian society. In an attempt to fill the gaps in, we started the discussion with an explanation of the concrete proposals on the economic governance and what way they have gone through in the course of the past year. Ms Zinaida Zlatanova, Head of the European Commission Representation in Bulgaria, recalled that in May and June last year the European Commission made proposals in three main areas: reform of the Stability and Growth Pact through more effective prevention and tougher sanctions, as well as enhanced coordination of fiscal policies; macroeconomic surveillance in order to reduce macroeconomic imbalances and stimulate competitiveness; outlining the framework for crisis management in the euro area and establishing a permanent European Stability Mechanism. Since the beginning of this year, the main instrument for early coordination of economic policies has entered into force - the European Semester and it is already operational. The Commission's proposals on the economic governance have been put through serious discussions in the European Parliament, followed in details by euinside. Six parliamentary rapporteurs have presented reports on each of the proposals that have been discussed along with over 2000 amendments, and ultimately adopted by the economic committee of the European Parliament. This allowed the beginning of negotiations with the Council (where the Member States are represented), in order an agreement to be reached before the final adoption of the package by Parliament. But even to date, there is no agreement. While trying to understand the participants' positions on various details of the Six Pack, we stumbled upon an insurmountable obstacle – the lack of clarity what are Bulgaria's positions on these issues and how have they been reached. Ms Iliana Ivanova pointed out that the Bulgarian position had been clearly articulated and defended during the debates on macroeconomic imbalances surveillance, for instance. With the decision there not to be a European average value but upper and lower thresholds of the indicators, "Bulgaria and the new members will receive a more favourable treatment in terms of reporting macroeconomic imbalances, while taking into account the catching-up effect,” Ms Ivanova explained. Ms Zinaida Zlatanova added that regarding another key issue - the single tax base – there has been a consistent position of a third consecutive Bulgarian government. The fact is, however, that Bulgarian positions are neither discussed broadly enough, nor acquire much of visibility. Even for the lawmakers in the national parliament it is often hard to find them, as Martin Dimitrov explained, Co-President of the Blue Coalition (a right-wing party coalition) and chairman of the parliamentary economic committee. "There is no national position on the economic issues we are discussing today [...] I've conducted almost an investigation to find out the position of the Finance Ministry, which proved to be correct, but I had to use personal contacts to reach it, people were secretly giving me documents so as to find the position of the Ministry of Finance on this matter". According to Martin Dimitrov, "if our Prime Minister wants to be strong when debating on such issues like these we are discussing today, he should be backed by a Parliament's position." Mrs Meglena Plugchieva Vice-Chair of the parliamentary Committee on European Affairs (a representative of the Bulgarian Socialist Party), recalled the case of the Euro Plus Pact: “One Friday the Prime Minister came in plenary surprisingly, and within 5-10 minutes he said 'I'm leaving for Brussels and I came to tell you that I would include Bulgaria in the Euro Plus Pact ' and a complete chaos occurred whether he was talking about the Euro Plus Pact or the European stabilisation mechanism - what it was all about at all”. Ms Plugchieva, who was a Deputy Prime Minister responsible for EU funds in the previous Government, defined this approach as frivolous. She admitted that even the lawmakers were not familiar with the topic. She called for a much closer contact between the members of the European and the national parliaments, as well as for involving NGOs in the debate as a way to engage the whole society. In response, the Chair of the parliamentary Committee on European Affairs, Monica Panayotova (GERB), explained that what Mrs Plugchieva insisted on had already been done. As regards the relationship with the EP, every 6 months (at the beginning of each Presidency) a regular parliamentary meeting was being organised, where Bulgarian priorities were being outlined in the context of the Presidency’s priorities, so that the MEPs' “to be aware of the Bulgarian position when defending positions within their own political families." The Bulgarian Parliament has benefited from its right, under the Lisbon Treaty, to send motivated positions to the European Parliament. "Indeed the first motivated position of the Bulgarian Parliament was precisely in terms of the so called Six Pack - with legislative initiatives regarding the new economic governance and the common consolidated tax base.” Within the parliamentary European Affairs Committee, a Council for Public Consultations has been formed which includes representatives of NGOs, business, academia and trade unions. According to Vladimir Shopov, a political analyst, however, the problem is more serious and is linked to the general lack of management of our European membership, "Bulgarian membership is being administered, not managed." There is a "complete lack of strategic capacity within the Bulgarian administration," Mr Shopov noted. It is therefore necessary to establish a "managerial system of the Bulgarian EU membership" and have a single place where all positions can be rationalised and integrated into a common position of the country. Former Deputy Minister of Finance Lyubomir Datzov (National Movement for Stability and Prosperity - NDSV) also asked "where is the strategic think-tank within the Bulgarian government?" In his words, "the biggest problem is that ten or twenty people, including my colleagues at a very high level in our representation in Brussels, actually set the tone and things are a bit turned, if you like, because of the minimised role of the Bulgarian Parliament." In addition, according to Mr Datzov, Europe is no longer a political priority in Bulgaria neither for the government, nor for most people: "The issues of Europe are issues of a narrow range of professionals and they are not widely discussed in the society." The same argument was also expressed by Georgi Angelov, a senior economist at the Open Society Institute Sofia: "There can be no debate if no position of Bulgaria is published, as some people gather at the Council for European Affairs, they decide something and send it to Brussels. There it goes to some drawer and no one in Bulgaria knows what exactly we had sent." Again, he gave the example with the Euro Plus Pact, when in fact the discussion flared up ex post facto but it was helpful anyway because after that the Prime Minister had withstood in a much stronger manner the Bulgarian position. Monica Panayotova admitted that "in terms of the Euro Plus Pact, it appeared that there hadn't been enough information at the beginning and a defencive position had been apprehended on the decision to join. Nobody said that, first, it was a political document without having a legally binding nature. Nobody said that, ultimately, as a country aspiring to join the euro area [...] it was important for us to be part of this more internal integrational space. This does not mean that Bulgaria, when it becomes part of the eurozone, cannot defend its concrete measures and thus is forced to accept unfavourable positions." Vladimir Shopov defined as a paradox that namely in terms of the Euro Plus Pact the government failed to show that "Bulgaria had actually a fairly successful diplomacy during the negotiation on the Pact." The debate about the Pact, however, revealed a "worrying lack of preparedness shown by other key institutions. For example, I am surprised that Bulgarian trade unions have interpreted the pact so superficially, because actually there are many measures it the Pact that can be used if the business and a more reformist state decided to conduct a series of neo liberal reforms." It was fully logical in the discussion on the development and defending Bulgarian positions, the issue of taxes to be highlighted. Martin Dimitrov was the first to grab the bull by the horns asking: "What is the benefit for Bulgaria and for Eastern Europe from the idea of harmonising the tax base? My strong opinion is that we will only lose from such a measure because the trend that insinuates itself here is of a tax increase. This is actually the idea, and because they cannot say it in this clear and direct way, it all starts with harmonisation." He was supported by Georgi Angelov who explained that for Bulgaria, as being the poorest country in the EU, achieving the highest economic growth was a number one priority. In this sense, besides pushing against tax harmonisation, Bulgaria has to defend its position in terms of macroeconomic imbalances surveillance. "If we have a lot of foreign investment, of course, we will import machinery from Germany and will have a current account deficit. Is this bad? It is not bad, but if they put a 3 percent threshold, and we have 12 or 25%, obviously we will be punished for something that is good, for attracting foreign capital." Similarly, wage growth in Bulgaria cannot be the same as in Germany, for example, Georgi Angelov explained. He said, if competitiveness was measured this way, as a result, poor countries would remain always poor. euinside clarified, however, that at this stage we talked about “tax policy coordination”, as stated in the Euro Plus Pact. We asked the participants why there were speculations in Bulgaria that the purpose of major European countries was to bury Bulgaria's economy and reduce Bulgaria's competitiveness? According to Georgi Angelov such opinions express "an overestimation of our importance": "We must protect our interests not because someone is working against us, but because no one is interested in us in Brussels. Moreover, no one in Brussels understands the small and poor countries. In Western Europe they were small and poor a hundred years ago. There is no such generation that understands what it means to be small and poor, needing a catch-up policy." According to Martin Dimitrov, regardless of whether we use the word “harmonisation” or “coordination” the meaning is the opposite of competition. And what the EU needs is a common market together with tax competition: "The direction for the EU is to become a true common market in terms of people, capital and goods, all obstacles to be either minimised or eliminated and there to be tax competition". He said the EU was at crossroads and must choose in the right direction - "towards a single competitive market." According to analyst Vladimir Shopov, the risks should not be exaggerated, because Bulgaria has systemic benefits of its EU membership. The issue is for us to have a mechanism for management of membership, so that those risks to be managed by applying counter strategies, seeking common fronts with other member states or binding support on some disputed issue with a position on another. "I would have bound Bulgaria's participation in the Euro Plus Pact with clear commitments from the old member states to deepen the single market, as we know the extension of the single market and its development in services is largely blocked by the old Member States precisely because the new member states have certain advantages there." Overall, says Mr Shopov, "with the changes of the economic governance that we are discussing here, the understanding of the North is being institutionalised on how the EU should function." Lyubomir Datzov summarised the issue philosophically: "Many people say 'we must protect our interest', but I think the smarter position is to think that when the train is on the move we must first change ourselves to be able to respond adequately to time and to go forward with much faster strides." Instead "we only grumble that the others do not respect us and the world around us is changing rapidly, in fact we must learn to run, run faster than others." After three hours of a heated discussion, the participants and the audience were adamant that there was no way such an important and large topic to be exhausted in a single conversation. We hope that the discussion, organised by euinside, will attract more interest to the topic and more activity from both institutions and society. This means to restore and enhance the practise positions that Bulgaria will withstand within the EU to be officially announced and discussed, unlike as it is now - behind closed doors and without the opportunity for questions.